Connect with Kevin A. Elliott! You can find copies available on Amazon.com, Barnesandnoble.com, or through Kevin Elliott at festivals he attends (we will post such information as it comes up). 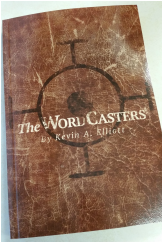 This book follows the young Timothy Walker as he learns about his 'gift' and The WordCasters. This is a YA Fiction novel. There is lots of action, a large host of interesting characters, and a side of the world not seen by most humans. I hope that you enjoy walking through this adventure as much as I enjoyed creating it. Any and all feedback is appreciated as I continue crafting other tales. Thank you for visiting this page, and I hope to hear from you soon.